According to Statista.com (https://www.statista.com/statistics/277125/share-of-website-traffic-coming-from-mobile-devices/), the percentage of global mobile Internet traffic grew from 31.16% in the first quarter of 2015 to 52.99% in the third quarter of 2017 and this trend will only continue in 2018 as more and more people in the world use mobile devices as the primary means of accessing the Internet. 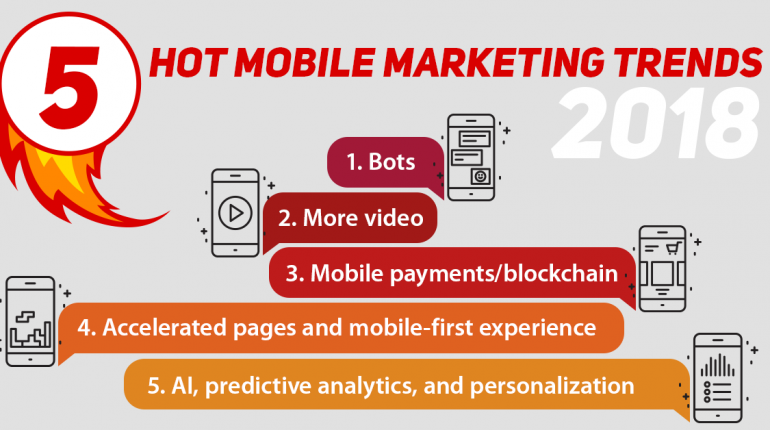 This article will introduce you to the hot mobile marketing trends to watch in 2018. Facebook announced that it will open its Messenger platform to developers during F8 conference in April of 2016. The company made its bot code available to developers in the spring of 2017. A messenger bot is an algorithm that automatically responds to messages on a Facebook page. Today, companies use bots not just for marketing purposes, but also to deliver news, content, entertainment, and help users with personal productivity. This trend will keep growing in 2018. The main functions of a bot are receiving and sending messages to users. When you connect a bot to a Facebook page, the bot will start scanning the messages of users and respond to messages you want. If you have an e-commerce store, you can connect the store to your bot and connect the customers that message you via the bot to your customer relationship management software. On Facebook, all conversations of your bot with your users are logged just like regular conversations and you can open and see them just like you would with regular messages. Facebook also provides page owners and developers with tools that show how the bots are doing in terms of engagement metrics such as numbers of users and numbers of events. Zenith Media has reported that in 2017, viewing of online video grew 20% compared to 2016. Worldwide, consumers have spent a little over 47 minutes a day watching video on the Internet, up from 39 minutes a year before. Experts expect that consumer with watch 25% more video on their mobile devices in 2018. At the same time, video viewership on laptops and desktop computers is expected to decline for the first time in history. Streaming on smart TVs will also continue to rise. All major social media and video platforms, including Facebook, Twitter, Snapchat, and YouTube are experimenting with new forms of video advertising. At the 2017 Sundance Festival, Youtube challenged content producers to tell a story in only six seconds, which is a new advertising format that Youtube recently started offering advertisers. Facebook plans to offer the exact same format to its video advertisers. Agency creatives and filmmakers crafted a number of videos using humor and various simple themes to fit the format. If you want your advertising to be effective in 2018, you will need to start using more video and learn to stand out and attract the attention of your prospects and customers while using the video format, be it 6-second videos or longer clips. Digital currencies, including Bitcoin, Ether, and Litecoin saw unprecedented growth in 2017. In the beginning of December of 2017, Coinbase, an exchange that allows users to trade digital currencies, became the most popular app on the Apple app store. Digital currencies are based on blockchain technology that works like a distributed ledger. Blockchain technology embraces the idea of transparency. Each block of a blockchain contains a record of the transactions that are occurring on the network. For a transaction to be valid and accepted by the network, it needs to become a part of a blockchain block, which means that the blockchain contains a record of all the transactions that have happened on the blockchain network since its inception. Every copy of core blockchain software for a particular network contains a full record of the blockchain for the network. This is true for all blockchain networks, including Bitcoin, Ethereum, Litecoin, and others. This means that if something happens to several computers on a network, the network will still be functional and keep operating. Blockchain networks are also decentralized. All transactions on the networks are peer-to-peer. As the popularity of blockchain technology grows, more and more people will be interested in paying for goods and services with digital currencies. Currently, millennials represent about 25% of the population in the United States. They lead the change when it comes to mobile payments. Millennials opt for easy and seamless experiences that companies such as Starbucks and Uber implement in their businesses. Wal-Mart has reported that over 70% of the traffic to its website during Black Friday Sale of 2017 in the United States came from mobile devices. The number of mobile visitor to Target’s website during the same time period was over 60%. This means that 2018 is going to be the year when businesses will have to start to put mobile users first. There is a significant difference in what users are expecting when they are opening a website from a mobile device compared to a desktop. Mobile searches and Internet browsing are about context. A person looking at a website of a restaurant from a mobile device is much more likely to go to the restaurant shortly after visiting the website, especially if the person is searching for a restaurant in the vicinity of his or her current location. This provides businesses that focus on local marketing with a lot of new opportunities. Web page loading speed is critical for great user experience on mobile devices because the quality of connection can differ greatly even in major urban areas of the United States. Accelerated Mobile Pages is an open-source project that helps pages load up to four times faster compared to regular load speed. Chartbeat reported that websites that use Accelerated Mobile Pages see up to 35% increase in engagement. Alexa, Siri, Cortana and other solutions are already using artificial intelligence and machine learning to predict what customers may be looking for and what products they are likely to buy and use based on their previous purchase and usage history. Facebook is using the same approach to figure out what ads its users will interact with and what content the users will find engaging. This is the core of Facebook’s business because the longer it can keep users on the platform, the more ads it can show and the more money it can make. Artificial intelligence and predictive analytics are changing significantly the way that websites present search results, products, and services. This is leading to more contextual and personalized experience, which is something users will expect in 2018. 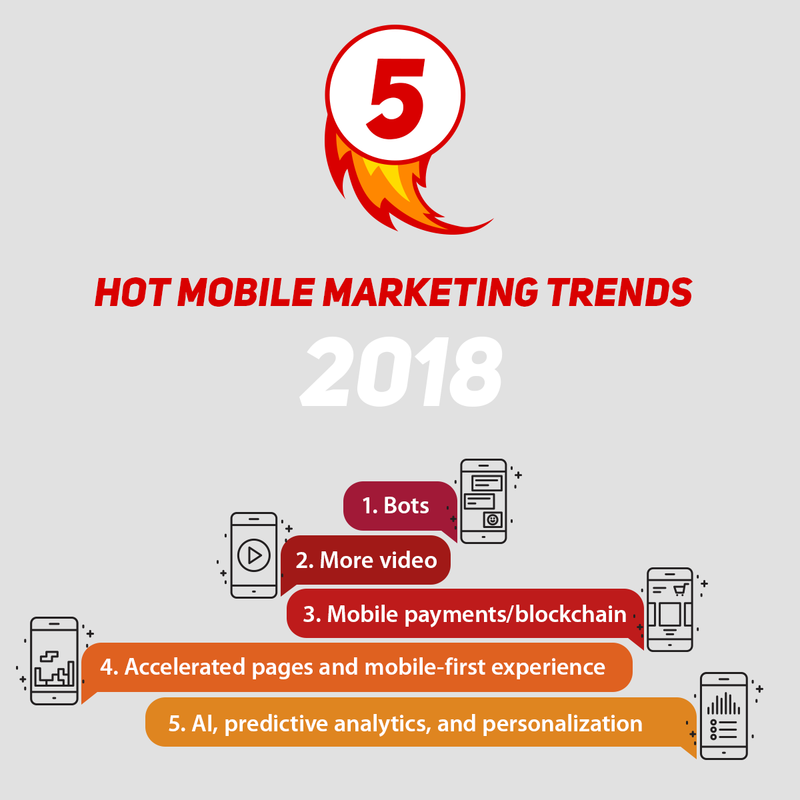 While the landscape of mobile marketing is changing all the time, it also presents more opportunities than ever to brands that use the described trends and technologies to stand out from the competition and capture the attention of their prospects and customers. Video, Video, Video for me. That’s what we as a society are becoming – or a least millennials and generation Z are. Great article Josh, thanks for posting. If you have time please would you check out my blog and let me know your thoughts?